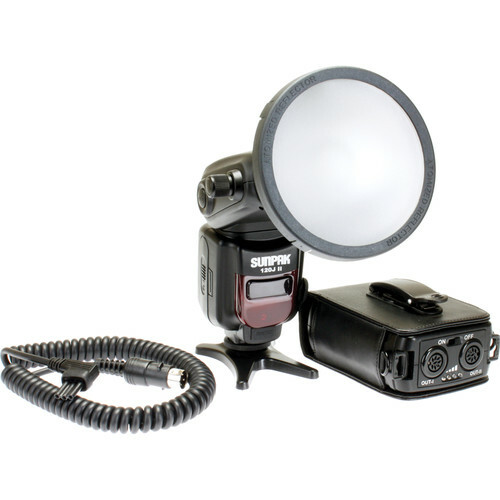 The Sunpak 120J II Flash Kit offers a bare bulb-style on-camera flash for Canon cameras with E-TTL / E-TTL II functionality. The bare bulb lighting style provides a more natural, rounded lighting pattern compared to the rectangle shape common with modern Speedlites. It also features a guide number of 177' at ISO 100 and 105mm which contributes to the effective range of 4.3 to 190.3'. The 120J II also includes an external power pack and cable for a fast recycle time of 1 second. Box Dimensions (LxWxH) 15.3 x 10.5 x 6.2"
120J II Flash Kit for Canon Cameras is rated 3.5 out of 5 by 2. Rated 4 out of 5 by Kevin from Powerful flash for shooting on location So far so good. It's pretty much what I expected. It's a powerful flash unit with an external battery pack. There are lots of different options for diffusion because of the removable diffuser and reflector. It's excellent value for the money, I think. A few small things I'd change... the manual is terrible. I haven't seen a manual translated into English this badly since the 1980s. It's practically gibberish. I guess this adds to the retro appeal of the unit. Also, the coiled cord is very tight and short. It would be nicer if it was longer or stretched more easily. Also, I'm told that standard Elinchrom accessories will not fit onto this unit because they changed the dimensions slightly from the original 120J. That seems like an unnecessary limitation. Rated 3 out of 5 by Chuck from Normal Lens Flash Nice build, Great that it uses AA batteries or power pack. The down fall is flash angle coverage.. 50mm on a full frame is about as wide as you get even with the diffuser. Can you use another power pack, like Lumedyne with this unit? The Sunpak 120J II is not compatible with other power packs. Do you carry replacement bulbs for this product? Can i use Quantum turbo battery or quantum battery 1 with this flash? The power cord on the Sunpak 120J II Flash Kit is 13 normal, and 55 stretched. can you buy an extra battery pack? Unfortunately, we do not carry the power pack for the Sunpak 120J II separately. The Sunpak 120J II has a battery life of approximately 2000 photographs powers quarter, 1/16 and 1/32. There seems to be some confusion about whether this unit has the high speed sync feature. Has anyone figured this out yet? Thanks. I don't use the high speed sync feature,but i find this has great recycle times.Sorry i couldn't help better. how many flashes can fire the bulb in its life? I have a couple of its predecessor, the J120, where the flash bulb is still going strong after many years of use. Bare bulbs usually last a really long time and are easily replaceable. I did end up sending the new 120 j II flash back because the exposures on auto were not very consistent. On manual exposure mode the flash is pretty good especially if you consider the value of getting a small battery with it.